Remember a few weeks ago when you were scrambling around trying to find the perfect gift for Mother’s Day? Remember when you waited to the last minute to find just the right gift? Take those bad memories and transform them into action! Take the tomorrow of your to-do list and get your Father’s Day gift shopping done today. Now. Executive Essentials can help you find just the right gift from our extensive catalog of fun and classy executive items from briefcases to fine pens. In fact, taking a look around from top to bottom, it’s clear that we have a little something for every type of father out there. So this year, instead of making a hand written pack of coupons for car washes and garage cleanings, try your hand at picking out one of the following fine writing instruments that won’t empty your bank account. The Dragon Space Capsule just returned from a triumphant mission that ushers in a new age of space exploration. We now have private corporations venturing into space successfully, which is great seeing as publically funded space exploration has been put on hold for a few years. If you have a father that loves space, ships, astronauts and heavenly bodies, then the Fisher Bullet Space Pen is a great gift for this Father’s Day. This pen can write anywhere anytime. You can write upside down, in freezing temperatures, in hot climates and it can even write on wet surfaces. Perfect for when you’re at the beach counting whales. All of this is possible with the use of a pressurized cartridge that pushes the ink out as you write (in any direction). Truly the stuff of astronauts. Not only is this pen fully functional, but it has style to boot. The pen is made out of brass from tip to toe and has a stylish, matte black finish. Measuring just over 5 inches when open and just under 4 inches when closed, the pen fits well in a pocket but has the length for steady writing when needed. Its shape is all future, with sleek lines capturing the presence of spaceships and crafts of sci-fi movies throughout the ages. Coming in at under $20 before shipping, this pen is out of this world. Go ahead and check out other Fisher Pen Gift Ideas as well. Maybe your old man is a lover of rock-and-roll. Real rock-and-roll, not that fuzzy, gargling tripe you youngsters listen to today on your independent stereo systems slung around your neck. I’m talking about songs written so well, they can entertain generations of fans on the radio day after day, year after year, decade after decade. I’m talking about bands like The Beatles and Elvis. If these are the types of sounds you hear coming from the garage or your dad’s den, then you need to take a peek at the offerings that Acme has in their Beatles and Elvis collections. These pens from Acme were inspired by the explosive sounds of rock done right. These fine writing instruments capture the helter and skeltor that was music during a great era of rock-and-roll. 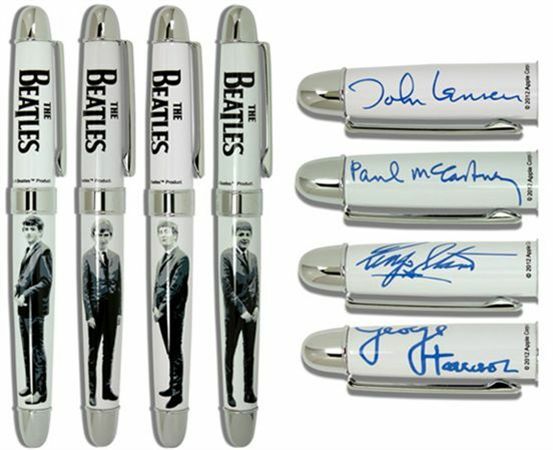 Coming in at just under $100 dollars, there is a mix of great pens to choose from in these collections, of which one will surely please your dad.Maybe your old man is a lover of rock-and-roll. Real rock-and-roll, not that fuzzy, gargling tripe you youngsters listen to today on your independent stereo systems slung around your neck. I’m talking about songs written so well, they can entertain generations of fans on the radio day after day, year after year, decade after decade. I’m talking about bands like The Beatles and Elvis. Smoking might be on the way out as a popular pastime for folks, but generations ago, smoking was as much a part of a day as eating. So we can blame our parents if they still enjoy a cigar once and a while to celebrate a special occasion or to just relax in the name of a lazy day. The Fisher Cigar Punch Ballpoint pen is a great novelty item that has just enough utility and just enough novelty to make it a perfect Father’s Day gift. Besides being handy for your cigars, Fisher’s Punch is the most dependable pen on earth. It will write upside down, underwater, and in extreme temperatures. To use the punch, separate the pen body from the key ring portion and apply the open end of the cap to the center of your cigar. Apply light pressure while rotating the cigar slowly until you are sure you’ve fully penetrated the cigar cap; 1/16” is plenty of depth. Think of the Punch as slicing or gently sawing through the tobacco. Pushing too hard or holding the cigar with too much pressure can cause the cigar wrapper to unravel. After punching the cigar, the cap will remain in the punch. Gently use the tip of the pen to flip the punched circle of tobacco into your ash tray. You’ll find it will work well this way even if the edge doesn’t feel very sharp. If the edge gets damaged or too dull, use the included stone to dress the edge by rotating the stone against the punch as if the stone were a cigar. Again, a light touch is all that is necessary. Right now this pen is coming in at a little over $30. It’s a great way to say happy Fathers Day. These are just a few more Father’s Day gift ideas from Executive Essentials. Come back and see more as the weeks roll on. Or take the time to look through our pen gift catalog yourself to find the perfect Father’s Day pen. With Father’s Day fast approaching, now is the time to start shopping for a great gift. One trend that has really taken off the past few years is the business backpack. They offer the necessary features of most traditional cases yet free up your hands for the daily commute. Here are a few tips to pick out the right backpack for you or as a gift. First, you will have to decide which material you want for your backpack. Nicer backpacks tend to use either leather or nylon. Leather backpacks offer a classic look that many prefer and can be monogrammed. However, they are a bit heavier and do take on a worn look over time (or character as we like to think of it). Nylon has become very popular and is the longest lasting. The weight of nylon backpacks can vary based on the quality of the nylon and the features of the bag. The least expensive and usually the lightest material is polyester. They do tend to wear quicker than the other backpacks so they might not be great for daily use but are ideal for the occasional backpacker. Once you have picked a material the next question is size. Many companies have made their backpacks smaller due to customer demand, but larger ones still are available from some companies. Your size needs will depend on what you plan to carry with you. First, consider the size of your laptop. If you have a larger (16”+) laptop make sure that you purchase a backpack that can handle that size. Next, will you be carrying a lot of files or bulky items (such as an extra pair of shoes)? If you make sure that there is a large pocket to place such items in. If you have a smaller laptop and you don’t carry much with you a smaller backpack should be perfect for you. Last major decision to make is the design of the backpack. What truly differentiates a business backpack from other backpacks is the pocketing. Most business backpacks have smaller front pockets that have compartments for items such as business cards, phones, tablets, keys, and passports. Also, many of them have a strap in the back for putting over a luggage handle. Other popular features are pockets for a water bottle and an umbrella. If you are still unsure of what size you need or if this backpack is going to gift a good guide is to measure the briefcase being used now. That will be a good place to start then if you feel like it’s too much or not enough room go from there. Also, when you pick one, try it around the store or house and see how it feels on you. Slight differences in padding can make one feel better than another. After all, a quality backpack will be yours for many years so it should feel just right.